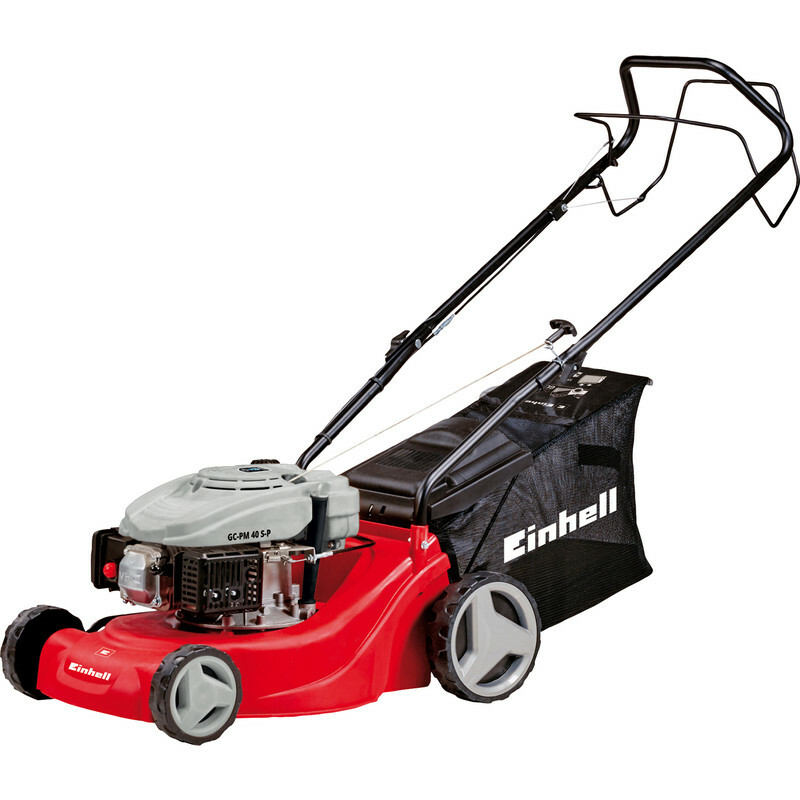 Einhell 99cc 40cm Self Propelled Petrol Lawnmower GC PM40SP is rated 4.4 out of 5 by 28. Rated 4 out of 5 by Chris S from Simple to use, works well Decided we needed to upgrade to a petrol mower as corded was limiting range and movement. 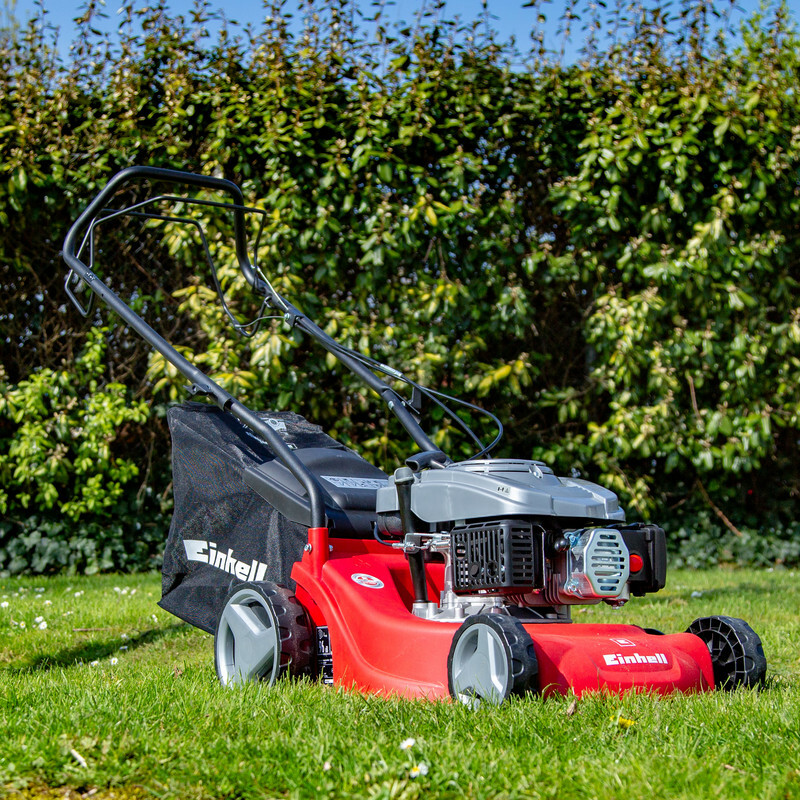 The 99cc mower is solid and well built and more than powerful enough for a big expanse of lawn and roadside borders. It was simple to set up and started without trouble. Have only used the once so cannot comment on the long run but first impression is it is exactly what I needed. Rated 1 out of 5 by Cybgak from Rubbish for anything except a pristine lawn If you're likely to hit the odd stone whilst mowing your lawn then avoid this machine like the plague. Mine started getting holes in the main plastic body of the mower the first time I used it and ended up being so bad after three or four uses the grass no longer went into the bag any more! When I tried to get a refund I was told it was my fault for running over a stone however I've had plastic mowers for years and never had a problem, I guess it's just the combination of the power of a petrol mower and a plastic body. Had to buy the 149cc metal version in the end which has proved much sturdier. Rated 5 out of 5 by Dangler from Handles well. Bought this to save on the back , great to be driven round the lawn. Rated 4 out of 5 by CEAR from Fine so far. Firstly, the mower took a while to arrive. I ordered it on a Friday afternoon, and it came on the Tuesday afternoon. Moreover, I think it had not been kept upright, as there was oil inside the box, on the mower body and on plastic bags with parts inside. The cap on the oil reservoir was loose, so I assume that it had leaked from there. I wiped it all down thoroughly, but of course have no idea if the oil had seeped into the engine or onto anything important. I'm not convinced that this model has the Briggs and Stratton engine I had wanted. I did manage to assemble it, though the pictorial instructions are not great. The body is plastic, which was a surprise, as my previous petrol mowers have been metal. Still, that makes it lighter to manoeuvre, so fine for me. It did take many pulls to get it to start, despite claiming to have an "easy start" system, and I did prime it first. It may be that it was because it was the first time of using it, but I shall be unhappy if this continues to be a problem, as I really need it to start on the first pull. It cut well and was a perfect weight for me. So, we shall see! 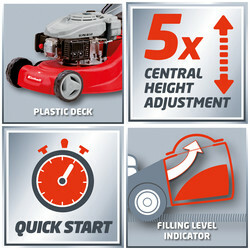 Rated 5 out of 5 by Rackie32 from Great mower Only used once so far but seems great. 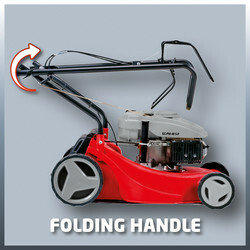 Rated 5 out of 5 by Glarn from Einhell self propelled petrol lawnmower I have used the lawnmower twice and its spot on. Nice steady speed and cuts well. Not overly noisy too. Rated 4 out of 5 by Iain1976 from Suspect build quality, but does the job... 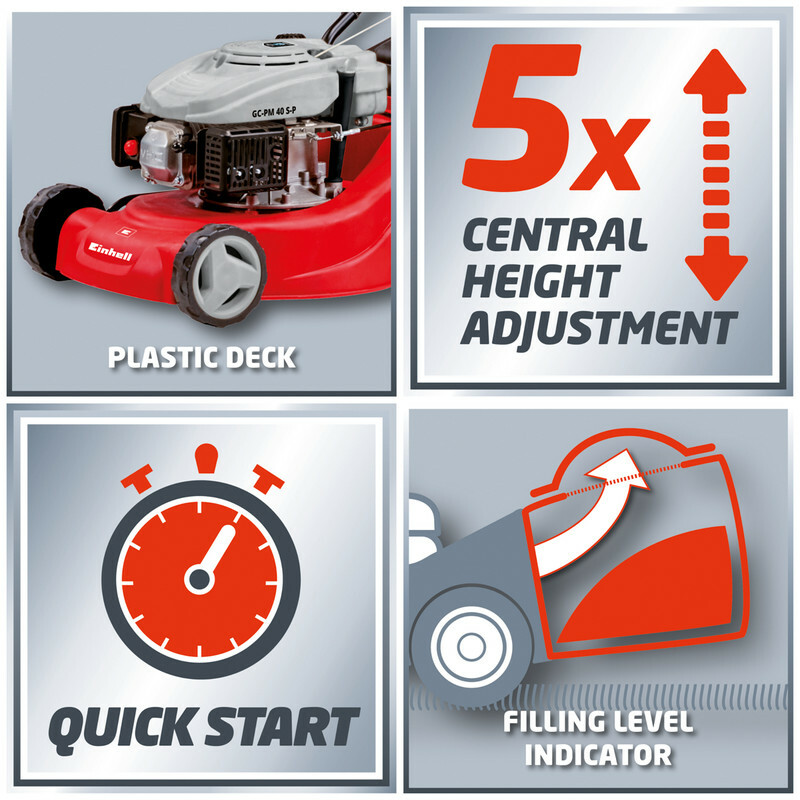 When putting the lawnmower together there were three basic, but troubling, issues. Firstly the handle bars don't mount flush with the posts that attach to the mower (one of the posts is bent to the wrong angle). While it doesn't affect performance, it does look a bit odd. Secondly the throttle cable is not long enough to be strapped to the handle so runs diagonally between the handle bars, again doesn't affect performance but looks odd and there is a risk that it could catch. Finally, the lever that attaches the front and rear wheels for raising and lowering height was jammed underneath the front wheel (meaning you were unable to adjust height. To resolve, I had to remove the front wheel, release the connecting bar and then re-assemble. Also, the collection box is narrower than the point that it connects to the mower meaning it is really fiddly getting the box on and off. 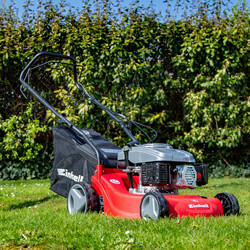 Having said all of that, once I got it assembled (of sorts), I have used it for a couple of weeks to cut just under an acre of grass and the engine starts easy enough within the first few pulls and the engine is powerfull enough to deal with long, tough thickets. In summary, suspect build quality but does the job and I guess you get what you pay for. It is exceptionally cheap for the size and spec.